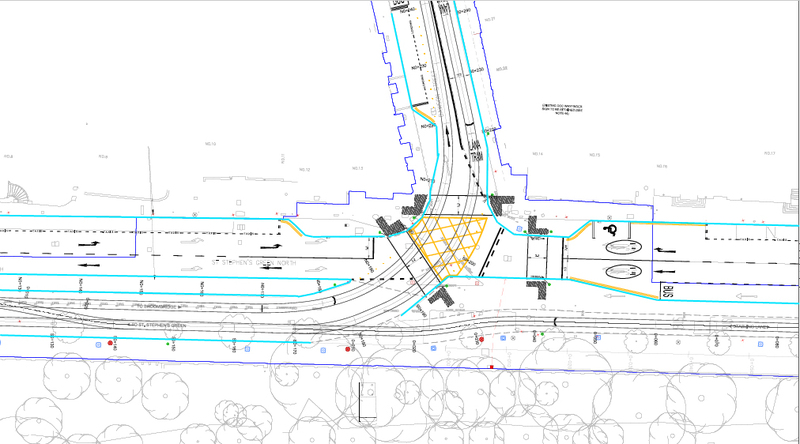 A long-promised contra-flow cycle route on St Stephen’s Green West may finally be constructed as part of the Luas Cross City works, according to drawings released after a Freedom of Information request. The contra-flow lane on St Stephen’s Green West, however, may not stretch onto the north side of St Stephen’s Green and there’s little to no other cycling-friendly measures planned on St Stephen’s Green West and North. The Luas drawings were released to IrishCycle.com at the end of last year and Transport Infrastructure Ireland confirmed last week that these are still the most up-to-date plans. But as with any such plans for Luas, these are subject to change and may be overridden by plans in the Dublin City Centre Transport Study proposals. IMAGE: A map by IrishCycle.com outlining the current access plan for St Stephen’s Green West: Pink = current southbound; red = current northbound; green = current short two-way cycle path; blue = planned contra-flow lane. 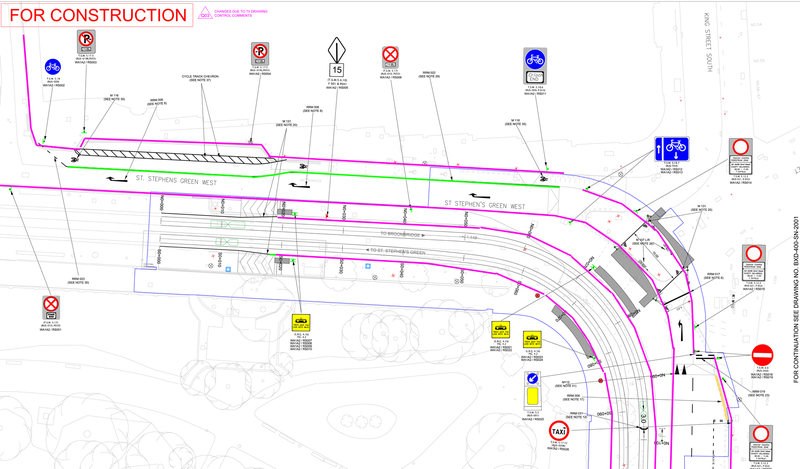 IMAGE: The current Luas plan for St Stephen’s Green West with highlighting added by IrishCycle.com (green = new contra-flow cycle lane; purple = new footpath kerb lines between footpaths and roadway and tramway. Meanwhile, on St Stephen’s Green North at the Dawson Street junction there is currently zero visible provisions for cycling other than mixed general traffic lanes. Between the St Stephen’s Green Luas stop and Dawson Street, the extended Luas green line will be segregated from general traffic modes up to Dawson Street, but as the tracks turn up Dawson Street the northbound tram lane is mixed with general traffic (buses, bicycles, cars, vans, trucks etc). A short-term tram stabling / turn back track for trams will also be provided on St Stephen’s Green North, east of Dawson Street. IMAGE: A simplified version of Luas construction drawings (light blue lines = new footpath kerbs highlighted by IrishCycle.com; and dark blue lines = extent of Luas railway order works). There is no defined space for cycling planned for Dawson Street and cyclists will likely end up between bus stops and the northbound tram tracks or in the middle of the northbound tram tracks. The good news is that general traffic will likely be reduced on Dawson Street as it will no longer serve as through route. For private traffic, Dawson Street will mainly act as delivery access and routes to car parks — the right turn from Dawson Street to Nassau St will be blocked off to all, including bicycles. IMAGE: Between Dawson Street and Kildare Street will have no cycling provisions and will not allow for contra-flow cycling. On St Stephen’s Green North between Dawson Street and Kildare Street there will be no provision for cycling — this means people cycling westbound will be confined to a new narrower roadway mixed with buses, taxis and other general traffic. While people cycling eastbound will contuine to take a 620 metre detour via Molesworth Street, with the added challenge of crossing two Luas tracks on Dawson Street before turning into Molesworth Street. The above image from the Dublin City Centre Transport Study has a radically different vision for the area — there’s still time to progress such plans before Luas Cross City is due to be operational in December, but there’s so-far no signs of public progress on this. We’ll update readers when we hear of anything new on this. That’s very disappointing. Cyclists clearly rank at the bottom of the list when it comes to space allocation. Would it be possible to FOI the construction drawings for the section from D’Olier Street around College Green to Nassau Street? From the look of the relocated kerbs, little or no provision is being made for cyclists on Lr Grafton Street. A lot of the section between D’Olier Street around College Green to Nassau Street will likely be changed by the College Green Plaza and Dublin City Centre Transport Study works, so we excluded those from our request. What about the pedestrians??? Was this area not meant to be a pedestrian plaza? @BlackQueen2012 Time to get on your bike! Bicycles are the future. Invest in one now.